The tagline "Pocket the difference" may sound a little distasteful these days. In the wake of Enron, Worldcom and Refco scandal where the top executives of once reputable companies walk the talk by Pocketing the difference. 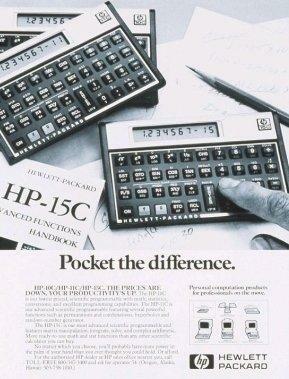 Anyway, the HP 15c is one of the most advanced scientific programmable and features matrix manipulation, integrate, solve, and complex arithmetic. Caption: Pocket the difference. HP-15. The prices are down, your productivity�s up.